, one of the most determined opponents of revealed religion in modern times, was born at Warrington, Lancashire, April, 1731, and at first educated by an uncle, who sent him to Emanuel college, Cambridge, when in his fourteenth year. Here he took the degree of | Ib. A. in 1749, and that of M. A. in 1753. At a proper age he was ordained, and for several years officiated as curate to his uncle, who had the living of Mitcham in Surrey. In 1768 he obtained the vicarage of South Mirnms, near Barnet, and resided in the vicarage house about two years, when, by the interest of John Dodd, esq. M. P. for Reading, lord Camden, then lord chancellor, presented him to the rectory of Tewkesbury. In conjunction with this, Mr. Evanson held the vicarage of Longton, a village in Worcestershire, about five miles from Tewkesbury, for which he exchanged that of South Mimms. While settled at Tewkesbury, he seems first to have inclined to those deviations from the opinions of his church, which by degrees led him much farther than he could find any to follow him, even among those who had hitherto been most distinguished for their hostility to orthodoxy. 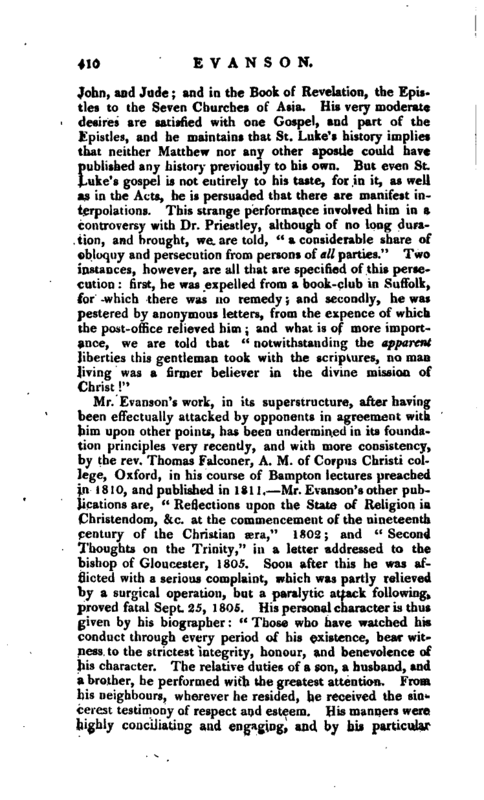 We are told that almost as soon as he began to entertain doubts concerning the doctrine of the Trinity, he wrote a letter to the archbishop of Canterbury, stating the rise of his first scruples, with the grounds of them, and requesting of his grace to favour him, by means of his secretary, with such information as might assist in removing those doubts, and enable him conscientiously to remain in his office as a minister of the Gospel, &c. At what precise time, or to what archbishop this letter was written, we have not been informed, but no answer was returned, or could indeed have been reasonably expected. 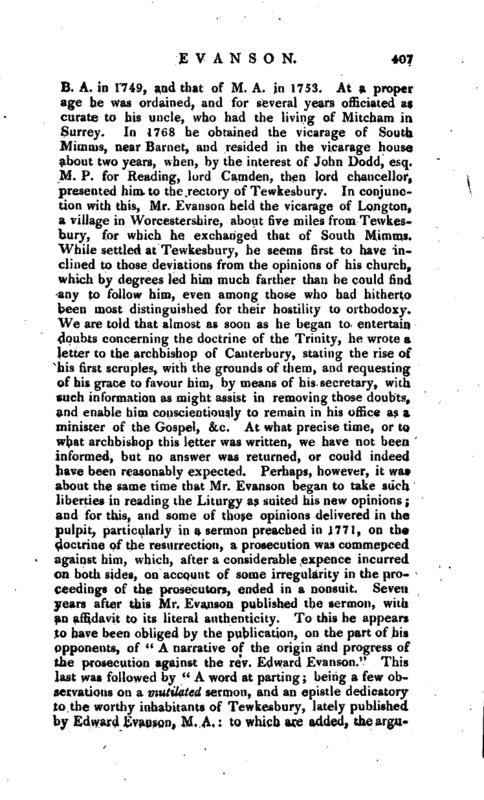 Perhaps, however, it was about the same time that Mr. Evanson began to take such liberties in reading the Liturgy as suited his new opinions; and for this, and some of those opinions delivered in the pulpit, particularly in a sermon preached in 1771, on the doctrine of the resurrection, a prosecution was commenced against him, which, after a considerable expence incurred on both sides, on account of some irregularity in the proceedings of the prosecutors, ended in a nonsuit. Seven years after this Mr. Evanson published the sermon, with an affidavit to its literal authenticity. 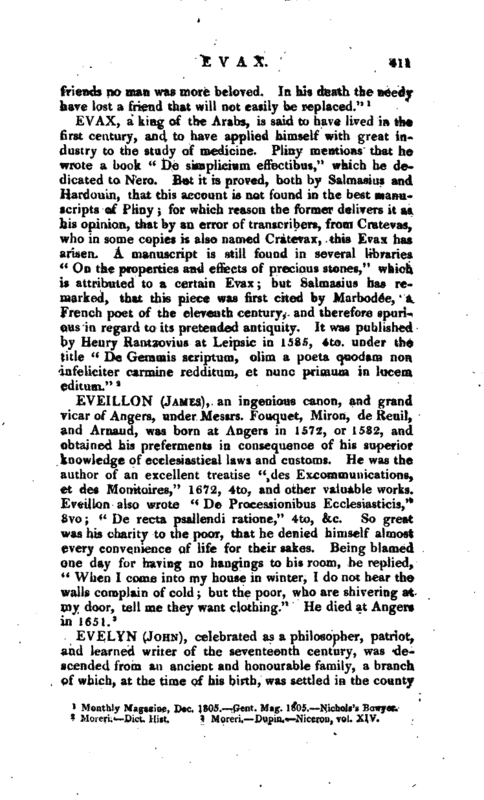 To this he appears to have been obliged by the publication, on the part of his opponents, of “A narrative of the origin and progress of the prosecution against the rev. 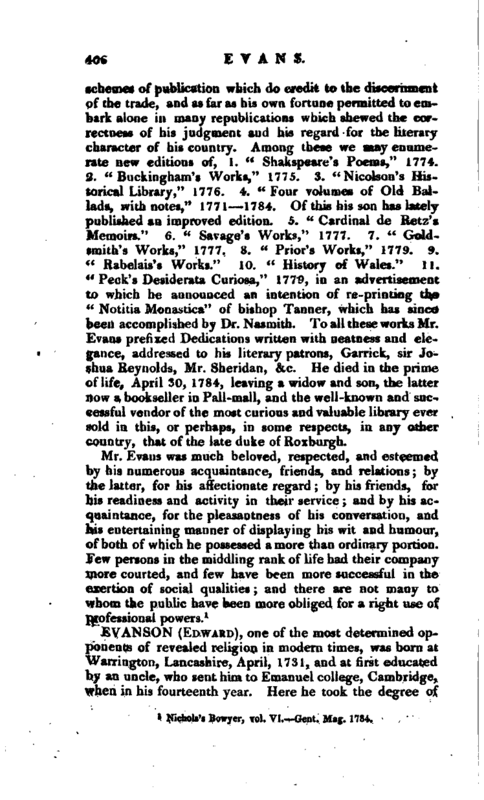 Edward Evanson.” This last was followed by “A word at parting; being a few observations on a mutilated sermon, and an epistle dedicatory to the worthy inhabitants of Tewkesbury, lately published by Edward Evanson, M. A.: to which are added, the | arguraents of counsel in the court of delegates touching Mr. Evanson’s prosecution.” Both these were published by the late Neast Havard, esq. town clerk of Tewkesbury, who had been principally active in instituting the prosecution. 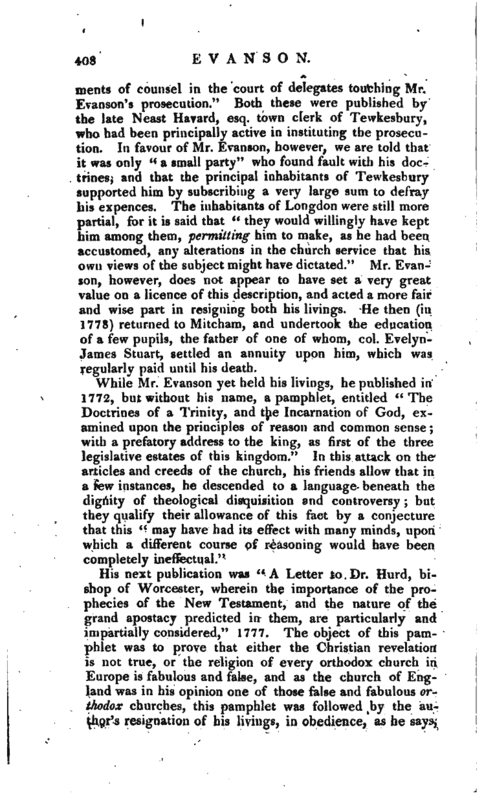 In favour of Mr. Evanson, however, we are told that it was only “a small party” who found fault with his doctrines, and that the principal inhabitants of Tewkesbury supported him by subscribing a very large sum to defray his expences. 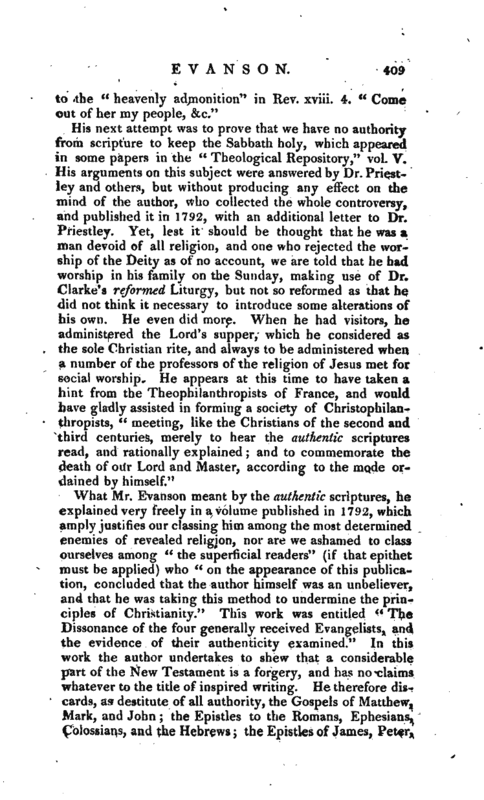 The inhabitants of Longdon were still more partial, for it is said that “they would willingly have kept him among them, permitting him to make, as he had been accustomed, any alterations in the church service that his own views of the subject might have dictated:” Mr. Evanson, however, does not appear to have set a very great value on a licence of this description, and acted a more fair and wise part in resigning both his livings. He then (in 3778) returned to Mitcham, and undertook the education of a few pupils, the father of one of whom, col. EvelynJames Stuart, settled an annuity upon him, which was regularly paid until his death. Monthly Magazine, Dc. 1805. —Gent. Mag. 1805. Nichols’s Bowyer.